The beauty of the dehesas, with its thousand changes according to the season, is a sight as fascinating as the sea or the desert. The dehesa, or pasture, is an agroforestry system, which allows a balance of non-abusive exploitation of natural resources. It contains a wide variety of flora and fauna including; man, Iberian pig, Holm Oak , Cork trees, aromatic plants and acorns. This exceptional habitat provides a natural and balanced diet to the Iberian pig. The acorn is an essential part in the creation of Iberico Ham. In the final three months, the pigs live out in the pastures (or Dehesa) during the “montanera”, a period from October 1 to January 1 when the acorns fall from the oaks. The pigs must feed on enough acorns and reach the DO-specified weight of 160kg to gain the coveted title jamón ibérico de bellota. The acorn has an index of unsaturated fatty acids, among which are: oleic (63.1%) which is also found in olives, linoleic (16.1%) and palmitic (14.2%). Regulations are so specific that there should be no more than one pig per hectare of land to ensure that each pig can eat the required amount of between 6kg and 7kg of acorns per day. Approximately the size of a football field. 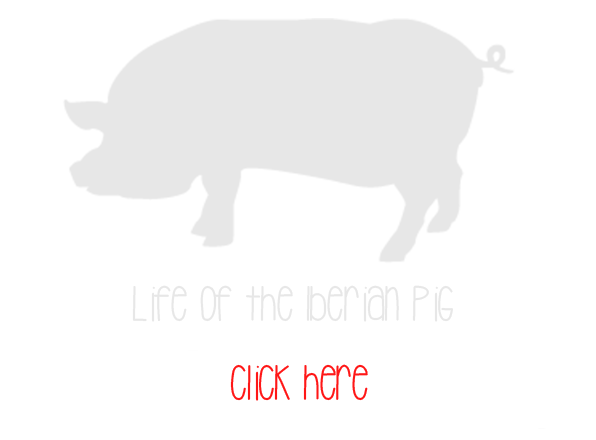 The Iberian pig, which is found in only in Spain and Portugal, has always lived in free range conditions that originate back to the time of cavemen. Thus this rare breed varies significantly from other pigs found elsewhere in the world. 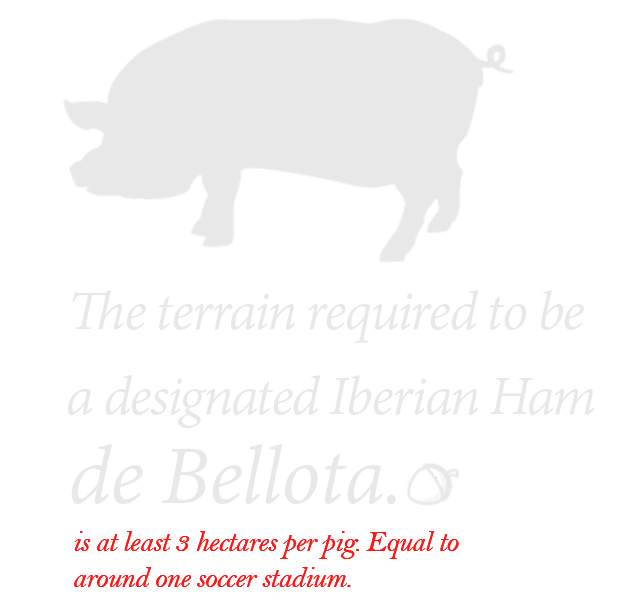 The pig has either black or dark red skin colour with long slender legs and black hoofs, often referred to as “pata negra”. Strict regulations require breeders to be careful to keep their stocks above 50% Iberico, which is why the designated D.O.  is crucial to the consumer in ensuring they are receiving the highest quality and standards in the meat. 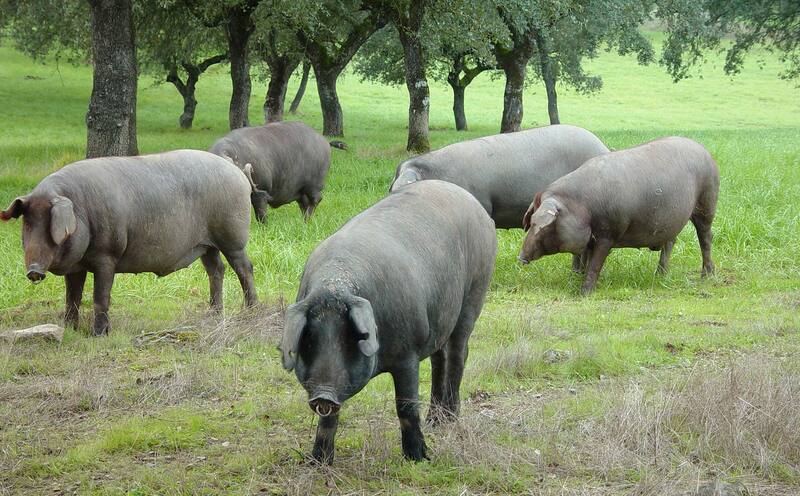 These pigs that are free range and fed exclusively with acorns and herbs during the "montanera", the season in which the acorns fall from the Holm Oaks in the Dehesa, or pastures, between October 1st and January 1st. The animals are fed with feed, but are also supplemented in their diet by being released into the the Dehesa (pastures) free range, for at least 60 days. Free range animals, but fed only on a diet of cereals. These three categories should also bear the words "100% Iberian" or "Iberian" depending on the purity of the breed. In case of cross-breeds, the percentage of Iberian breed must be indicated on the label, a minimum of 50% being required to be considered Iberian. THE CURING OF HAM AND THEIR PHASES. The four year journey of the ham, through which the product passes from the Dehesa until reaching your plate.